With the beginning of this ‘Autism Acceptance Month,’ we are entering the second phase of our “World Through Their Eyes” initiative. Do spread the word and help this reach the people it can benefit! Watch this space for more exciting news and offers. Edited to mention that the discount is till the end of the month. I was wondering if you would celebrate Autism Acceptance Month instead of Autism Awareness Month? “Autism Acceptance Month is about treating autistic people with respect, listening to what we have to say about ourselves, and making us welcome in the world.” (http://www.autismacceptancemonth.com/about/). Autistic people around the world use April to celebrate neurodiversity, promote respect, and support autistic people. 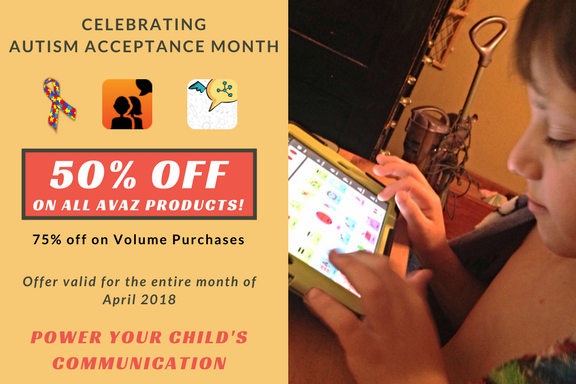 Autism Acceptance Month is in line with Avaz’s goals of communication, independence, and support. Please ask me if you have any questions.